Thanks to everyone who participated in The Big Read 2012, featuring The Paris Wife, by Paula McLain. The wide variety of programs, discussions of The Paris Wife and two books by Ernest Hemingway were attended by over 2500 people, including the final event with author Paula McLain. The Big Read committee met this week to start the process of looking for the book we will select for The Big Read 2013. If you have any ideas, please comment here or pass along your suggestions at the reference desk. 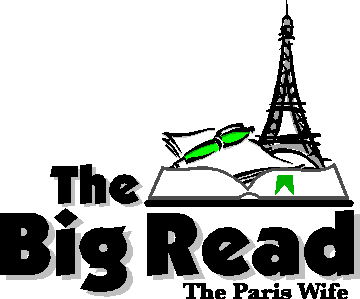 The Big Read is a cooperative project of ten public libraries: Clarendon Hills, Downers Grove, Hinsdale, Indian Prairie, La Grange, La Grange Park, Lisle, Thomas Ford, Westmont, and, of course, Woodridge. For more information, see our website at www.thebigread.org.